Built in 1747, the Wells-Thorn House presents period rooms depicting the lifestyle of Deerfield residents in a progression from the early days of 1725 all the way up to the high-style of the 1850s. It is furnished to illustrate the development of the agricultural economy, domestic life, and refinement in the Connecticut Valley. The earliest rooms of the Wells-Thorn House show life in Deerfield during the frontier period. As consumer goods became more plentiful, craftsmen expanded their skills, and gentility and modernity replaced security as a concern. Later period rooms in the house reflect the increased availability of consumer goods and the growing prosperity and sophistication of Deerfield’s residents. 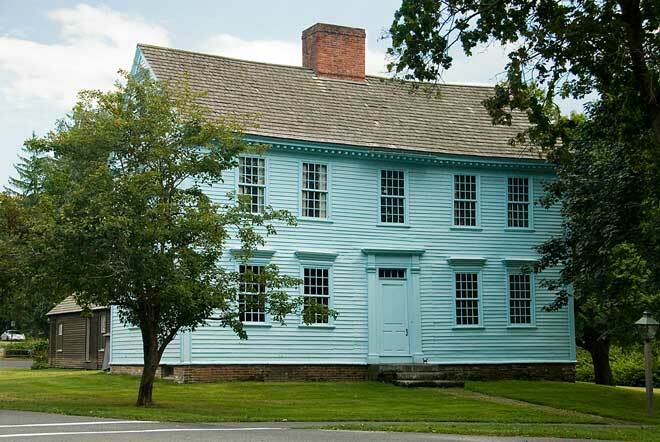 The robin’s egg blue paint was added around 1803 by a newly settled attorney who hoped the color would attract attention to himself and his practice. Each room in the Wells-Thorn House is based on a collection of Deerfield probate inventories from a particular time period. In early America, when the head of a household died, court-appointed appraisers made a list of all of the deceased’s personal property, called a probate inventory, which listed and valued everything in the estate from slaves to cattle to spoons and bed sheets. These documents provide valuable information about the lives and personal belongings of people in the past. Guided tours of the Wells-Thorn House are available on the hour during the regular season from 10:00 am to 4:00 pm. Please check at the Hall Tavern Visitor Center desk for more information about tour times.